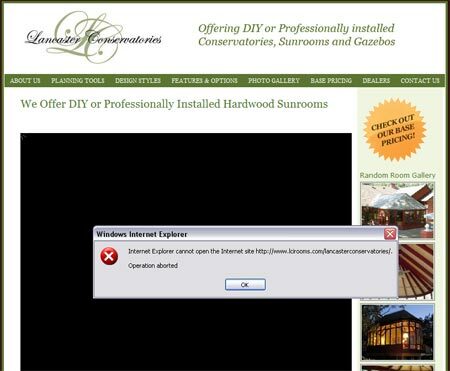 The following tutorial explains how to fix the “Internet Explorer cannot open the Internet site. Operation Aborted” error that is often encountered just after implementing either the Lightbox, Lightbox 2, Thickbox or Slimbox WordPress plugins. This problem effects Internet Explorer only and causes the page to partially load and then ultimately crash, resulting in an error stating that “Internet Explorer cannot open the Internet site”, Operation Aborted. As it turns out we need to make the Lightbox or Lightbox based script load after the rest of the page has loaded. Firefox and other browsers are not prone to this problem. The following covers how to address the “Internet Explorer cannot open the Internet site” issue with the Lightbox 2 WordPress plugin. Derivative plugins based on Lightbox may require similar modification. If all goes well, the IE Page loading error should be history. Note: If your using the WP-Cache plugin or similar caching software, you will need to clear your cache as well.